Vice Commander Maggio joined the New Jersey State Police in May of 1967. He served in numerous road stations in both Troop "C" (Central Jersey) and Troop "B" (North Jersey) and also patrolled Troop "E" (the Garden State Parkway). He was also assigned for a total of four years to the Troop "B" Tactical Patrol Unit, both as a Trooper and a Sergeant. In 1986, he was promoted to Sergeant First Class and assigned as Assistant Station Commander at Washington Station and Totowa Station. In 1988, he was promoted to Lieutenant and assigned as Station Commander of the Newark Station on the New Jersey Turnpike, Troop "D." He was then assigned to a staff position in 1990 at Troop "D" Headquarters in New Brunswick, New Jersey. 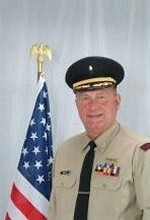 In 1992, he was assigned to be the Deputy Troop "D" Commander. In 1995, he was promoted to Captain and was assigned as the Troop "B" Commander in Totowa, New Jersey. He commanded eight road stations, with more than 300 troopers in North Jersey until his retirement on April 1, 2000. Vice Commander Maggio is also a veteran of the New Jersey Army National Guard. He served 23 years as the First Sergeant of Headquarters Company 50th Brigade, Fort Dix, New Jersey, and retired in 1995. Vice Commanderl Maggio has been an active member of The Cadet Corps since its inception in 1996. He is presently the President of the Former Troopers Association.